On average, the Church typically announces a temple when there are 32,657 members in a country. However, the median membership for when the Church announces its first temple in a country is 23,326. The countries with the fewest members to have a temple announced was Switzerland in 1952 (approximately 2,000 members), Guam in 2018 (2,500 members), and the United States in 1832 (approximately 2,661 members). The countries with the most members to have a temple announced for the first time include Mexico in 1976 (141,768 members), Honduras in 2006 (116,416 members), and El Salvador in 2007 (98,575 members). 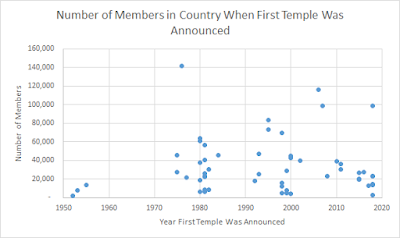 The years 1981 and 2018 tie for the most new temple announcements in countries where no temples previously operated as there were seven countries for both of these years where temples were announced for the first time. Currently, there is only one country, Papua New Guinea, which has more than the median number of members for when the Church announces its first temple in a country. Thank you for the research. I think overall it can be concluded that there is no clear trend. There are many factors to a temple announcement. Latin American nations generally have higher numbers. This may have been due to their large geographical and population sizes, as well as political climates and rapid membership growth in the 1960's to the 1980's. Other factors include whether it was the first temple in the continent, whether or not it was already close to other nations with temlples, and the number of templeless nations in the proximity. I do have a question of why Guam was included. If the subject of the research was first temples in countries and territories, then shouldn't Puerto Rico also be included? If it strictly countries, then Guam shouldn't be included. Also the United Kingdom is not included in the list. Perhaps you are considering Canada part of the British empire in 1913? Cory, I would join with you in thanking Matt for the research. This was a very informative post. I would also agree with your assessment that there are many factors going into the determination of when a temple is announced in any location, and I would say that the foremost factor in that regard is the Lord's timing of inspiration being sent to His prophet. We saw that happen with India, and I get the feeling that Guam may fit in that category as well, though that has not been explicitly stated. In addition to what you mentioned, I would add the overall number of stakes and districts, growth trends in the area, and whether or not members will be able to support a temple (through staffing it) and keep it busy enough (through attendance) as a few important factors. I would be very interested if at any point insight is provided about that process. I would also be interested to know what the criteria was for inclusion on this list. Either way, with 19 temples announced this year alone, we are likely in for a windfall of future events that will allow construction begin on the 32 announced temples. Although this year was supposed to be a big year for those kinds of events (and although that could still be the case if all goes well), I imagine that we will see a sharp and significant increase in the number of temple events in the near future. It will be interesting to see for sure. That said, with my thanks to Matt for continuing to allow me to do so, I would like to share again the address of my blog, through which I have done several new posts in recent days, covering a wide variety of subjects related to Church news in general and temple developments in particular, with special focus over the last couple of days on the first South American leg of President Nelson's Global Ministry Tour. Hopefully many of you will find the information in those posts to be helpful, and I continue to welcome any comments on those. Thanks again to you all. Cory, Puerto Rico is included in the list. It's part of the seven listed for this year. In-between Cape Verde and Russia. Oh yeah, you are right, thanks. Sorry - I forgot the UK - Post has been updated with revised mean and median membership for countries when first temple is announced. I'm so glad to see more temples. I made a promise to defend the church, so I added a clarifying comment to Tajikistan in case anyone's interested. I guess I worded things pretty poorly and kicked up a hornet's nest. 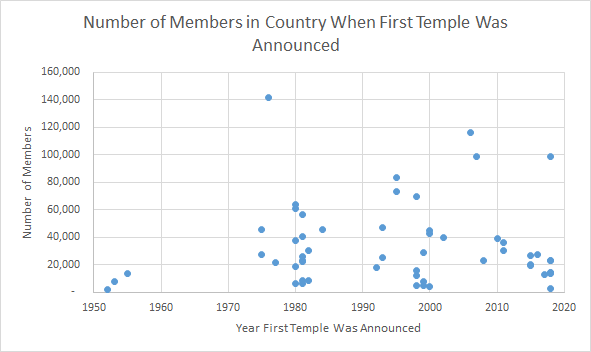 I'd be interested also to see the correlation between number of members and the 2nd temple announced for a country. The same thing for number of members per state/province where it was the first temple announced for that state/province. Specifically dealing with the US, Canada, Mexico, Brazil or other countries with multiple temples. If you want a tougher assignment that would prove very interesting, I would be curious to see how many members lived within 10 miles of the temple, 25 miles, 50 miles, 100 miles, 250, 500, and possibly 1,000. If we could compare these numbers to each other it would fascinating. Hard to do. Many Utah temples would not need to go past 50 miles. The difficulty with compiling additional data like that, though, is that there have been a couple of different temple-building "booms", first under President Spencer W. Kimball, then under President Hinckley. And unless that data took into account areas which have other temples announced, that gets even more complex. That said, I know that we have seen Presidents Hinckley, Monson, and Nelson take into consideration factors such as mileage from the closest temple, level of difficulty and cost of travel, whether or not there is a strong Church presence in such areas, or if any location is more isolated. So based on all of that, I would imagine that we have just barely scratched the surface in terms of what's coming for future temple construction. Given that President Nelson has emphasized the importance of temple worthiness, attendance, and worship during the just-over-9-month period of his administration, we are almost certain to see lists like this expand. And it would not shock me if this time 3 years from now, we see a totally different set of top 10 nations with the most members without a temple. If things do not slow down at all (which they don't show any signs of doing at all), then the sheer volume of temple developments may become very difficult for any one individual or groups of people to track and monitor. I would love to see Matt do other lists like this, but if that is not possible, I can understand. That said, I would welcome any additional insight he has into some of the factors mentioned here. With my thanks to all of you for your ongoing contributions to such conversations, and with my thanks to Matt for both providing such great content and allowing the conversations about it to be so wide-ranging, I would additionally like to thank Matt as well for allowing me to share updates from my blog. Given that President Nelson is half-way through what I am sure will be the first of many tours of South America in conjunction with his broader ongoing Global Ministry Tour, and given many other Church news stories and reported temple developments, I have been hard at work covering it all to the best of my ability. For any who are interested in catching up with or commenting on the latest content, I include the address of my blog below. My thanks again to you all, and especially to Matt. Keep up the great work! Hawaii with status as a US territory when the temple was announced there probably should be on this list.